Before reading this article, readers are advised to read the main article Arjuna's Military Campaign for Rajasua, that describes the entire journey of Arjuna for his military campaigns to the territories that lied to the north of Indraprastha. This article describes Arjuna's military campaigns in the territories controlled by or under the influence of the Kamboja tribe. The regions covered by Arjuna, mostly falls in the Jammu and Kashmir state of India and its immediate neighborhood in Pakistan and Tibet. Arjuna subdued Bhagadatta in Pragjyotisha (see Arjuna in Pragjyotisha) through peaceful means and extracted tribute from him and the kings under his sway. These territories lied mostly in Himachal_Pradesh. From there Arjuna moved to territories in Punjab that were under the sway of the Trigarta tribe (see Arjuna In Trigarta) which lied mostly in Punjab. Arjuna continued his march towards north and reached the territories controlled by the Kambojas like the Kashmira, Kamboja, Darada, Loha and Rishika. Mbh.2.26:- That bull of the Kshatriya race then defeated the brave Kshatriyas of Kashmira and also king Lohita along with ten minor chiefs. From the Puru city, Arjuna advanced further north and entered the Kashmira kingdom (Kashmir Valley) surrounded by mountains. Arjuna entered it probably through the Banihal_Pass, the southern gateway to Kashmir valley. Interestingly this lies 36 km to the west of the Singpur town, considered to be a Kamboja city (Simhapura). Kasmira kingdom is identified to be the Kashmir valley along the Vitastha (Jhelum) river, surrounded on all sided by mountains. This was formerly a large glacier during the Ice Ages. Later it turned to a large lake. It was inhabited by sage Kasyapa and his Naga race. The name Kashmira ( Ka = water; shimeera = desiccate) means the desiccated land. Before Indian-plate joined with the Eurasian-plate, Kashmir Vally was under the Tethys_Ocean. During the joining of Indian plate with Asian plate, this region rose up from the ocean. It became a huge lake locked within mountain folds on all sides. The lake froze during the ice ages becoming a glacier. After the last ice age it melted and again became a lake. Once there was a huge earthquake which broke open the mountain wall at Baramulla (Varaha-mula). The lake then drained out along Vitasta (Jhelum) river forming the valley of Kashmir. This geographical incident could be behind the myth of Varaha (an incarnation of Vishnu in the form of a wild-boar) who uplifted earth from a sub-merged ocean. The draining of the lake is also attributed to Kashyapa in another myth. King Lohita's territories seems to be the Lohara (Loh-kot, or Loharin) mountain valley. It is now known as Loran, in Poonch sector of Kashmir. There is a town named Rajpur 8 km west of Loran. It is not clear if this was the capital of king Lohita. 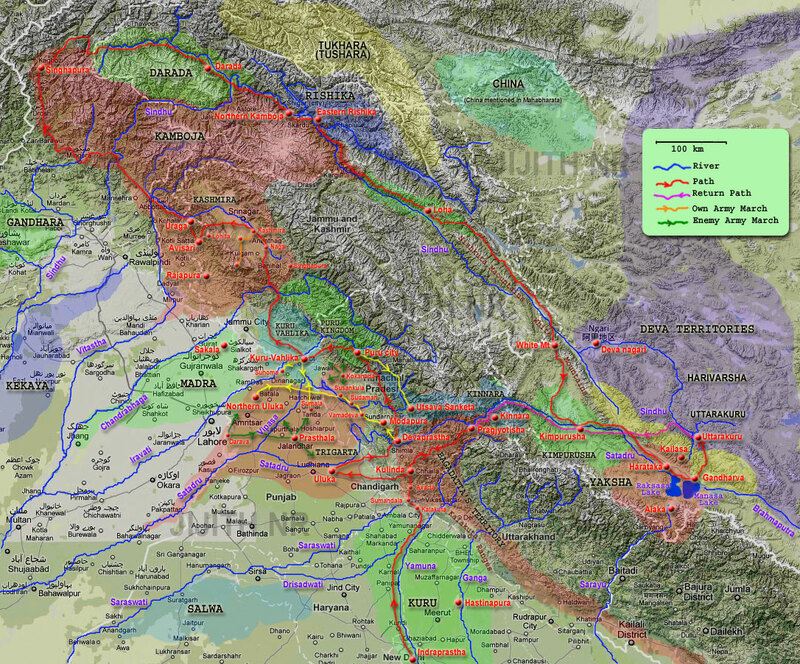 The territories of the ten minor chiefs probably lied in and around the Kashmir Valley. They could be the Naga chiefs who ruled in Kashmir valley. The Kashmir valley seems to be the original homeland of the Nagas, whose ancestry is often traced to Kashyap and his wife Kadru. The place names like Skardu seems to be related to Kadru. In Kashmiri language Nag or Naga means a fresh-water spring. There are many places named Nag in Kashmir like Anant-nag, Neel-nag, Konsar-Nag etc which are various springs. The ten minor (naga) chiefs could be each ruling small territories around these locations. Mbh.2.26:- He then took the delightful town of Avisari, and then brought under his sway Rochamana ruling in Uraga. After defeating the Kashmiras, the king Lohita and the minor chiefs, Arjuna went to Avisari, the town of the Abhisara tribe, believed to be situated in the Poonch valley, to the west of Kashmir valley. He also attacked the territory of Uragas ruled by king Rochamana, that lied to the north of Avisari. The town Avisari belonged to the tribe named Abhisaras. Abhisara was situated in the Poonch, Rajauri and Nowshera districts of Jammu and Kashmir. It was affiliated to the Kamboja power, the dominant power in Kashmir region during the Mahabharata-era. The town of Avisari is not yet identified. Poonch itself is a candidate location. During Alexander's campaign, Poonch was the capital of an Abhisara king. Uraga territory is identified to be Hazara region in Pakistan. Dr Stein identified modern Hazara with the ancient Sanskrit name Urasa which is same as the Uraga mentioned here. However it is also identified with the adjacent Abhisara tribe. There is also a town named Uri to the north of Poonch. This is a candidate location of the Uraga city of king Rochamana. Mbh.2.26:- Then Arjuna, putting forth his might, pressed the delightful town of Singhapura that was well-protected with various weapons. From the territory of Uragas, Arjuna marched further north aiming at a rich Kamboja trade-center and a well-protected city named Singhapura. Sinhapura, Simhapura etc are alternative spellings of 'Singhapura'. The name Singhapura (Singha, Simha = Lion; Pura = city) the city named after lion is often given to cities ruled by the Kamboja tribe. This is in contrast to the Kuru city Hastinapura (Hasti, Hastin = elephant; Pura = city) the city named after elephant. There are several place names in India (Singur, West Bengal), Srilanka (Sinhala) and South-East Asia (Singapore) that were named after Singhapura, due to the Kamboja influence (sea-trade, land-trade). There is a small town named Singpur 46 km to the south east of Anatnag. Coordinates: 33° 29' 0" North, 75° 34' 0" East. This is a candidate location of Singhapura or one among the Kamboja cities with the name, Singhapura. This location is 120 Km to the east of Rajapura (Rajauri) the capital of Kamboja. Another candidate location is Singur town (35° 53' 47N, 71° 47' 45E) which lied 6.5 km north of Chitral in Pakistan. This is however more than 400 Km north of Rajapura. From the context it seems the city sacked by Arjuna was the Singur town in Chitral, since his next move was to Darada (Gilgit). Arjuna is never mentioned as attacking Rajapura (Rajauri) the main city of Kambojas. He probably avoided it due to the risks involved. Simhapura was a major trade center-situated in an ancient trade route (much older than the Silk_Route) that connected Gandhara, Kamboja and other western countries with the eastern kingdoms in Tibet like the kingdoms of Kimpurushas and Yakshas, known for their wealth. Thus Simhapura was a very rich Kamboja city. Arjuna's objective was to collect as much wealth as possible from this city as tribute. Collecting maximum wealth was the main objective of Arjuna's northern military campaign. Probably he knew of the wealthy traders who travel through the northern trade routes like the one passing through Simhapura. Arjuna also earned the title Dhanan-jaya (Dhana = wealth; jaya = victory), meaning the one who won much wealth after he brought to Yudhisthira much wealth from his military campaign, compared to his other brothers. Mbh.2.26:- Then Falguna, taking with him a select force, defeated the Daradas along with the Kambojas. Then the exalted son of Indra vanquished the robber tribes that dwelt in the north-eastern frontier and those also that dwelt in the woods. From Simhapura, which was part of the Kamboja territories, he moved to Darada, that lied to the north of Sindhu (Indus) river. As indicated earlier, the Kambojas were the main power in the Kashmir area. Their capital or main stronghold was Rajapura (Rajauri). Arjuna avoided the capital city of the Kambojas but defeated other cities and territories of Kamboja. These territories spread along the western and northern regions of Kashmir Valley. The Kashmiras in the Kashmir valley, the Abhisaras and the Uragas were under Kamboja influence. The Kuru-Bahlika lied sandwiched between Kamboja power in the north (Jammu & Kashmir) and the Trigarta power in the south (Punjab-India). After sacking Simhapura, Arjuna traveled along the Kamboja territories and then entered Darada that lied to its north. Darada territory is modern Gilgit region, north of Kashmir Valley. It lied to the north of Sindhu river (Indus) while Kamboja territories lied to the south of Sinhdu. Darada's capital was known as Ghallata which is identified as the Gilgit city. It was an important city on the silk road during the time of silk-route trade. During the Mahabharata, too Darada lied in ancient trade routes. Mbh.2.26:- Arjuna subjugated the allied tribes of the Lohas, the eastern Kambojas, and northern Rishikas. The battle with the Rishikas was fierce in the extreme. Defeating the Rishikas, Arjuna took from them as tribute eight horses that were of the colour of the parrot's breast, as also other horses of the hues of the peacock, born in northern and other climes and endued with high speed. After collecting tribute from the Daradas, Arjuna traveled along the Sindhu (Indus) river. Thus his journey since then was actually in a south-eastern direction. However these regions lied to the north of Indraprastha (Delhi) and thus collecting tribute from these regions was Arjuna's responsibility. The Kamboja-Darada-Rishika region was well known for excellent horses famous for their speed. Mahabharata mentions about different categories of horses called the horses of Sindhu breed and the horses of Kamboja breed. Besides this he was following the trade-route along Sindhu river that lead into Tibet where lied the rich territory of the Yakshas, ruled by king Kuvera well known as the lord of treasures. Eastern Kamboja was an extension of the Kamboja territories into east along the southern shores of Sindhu river. Their main center could be the Skardu valley, located on the banks of Sindhu. The Rishikas were a tribe allied to the Kambojas. Their territory seems to lie adjacent to or overlapping the eastern-Kambojas. The Rishikas along with the Kambojas engaged in the trade of good quality horses with the kingdoms of Indo-Gangatic plains. Arjuna took some of these excellent horses as tribute from the Rishikas. The name northern-Rishika was used by narrators of Mahabharata, probably to distinguish them from the southern-Rishikas, a likely colony of the Rishikas close to Vidarbha in Maharashtra. The Lohas were another tribe allied to the Kambojas. The regions around Leh in Ladakh is identified to be the territory of this Lohas encountered by Arjuna. Loha also lied to the trade route that connected Daradas and Kambojas with the Kimpurushas and Yakshas of Tibet. Mbh.2.26:- At last having conquered all the Himalayas and the Nishkuta mountains, that bull among men, arriving at the White mountains, encamped on its breast. The tall mountain ranges to the east of Kashmir valley is the Himalaya mountains in this context. The Nishkuta mountains are the mountains of the Ladakh_range that extend along the north-eastern shores of Sindhu from the Sindhu-Shyok river confluence up to the Tibeten boarder. The White mountains (Sweta mountains) were the range that comes next to the south-east of Nishkuta. It lied to the south of China_National_Highway_219 in Gar_County of Ngari_Prefecture in tibet. Arjuna, after defeating the tribes living on the valleys of Nishkuta along Sindhu river, camped on the White mountains. Towards the southern valley of the white-mountains lied the territories of the Kimpurushas along the Satadru (Sutluj) river.